The card for today is another that I made using bits and pieces that didn't make the cut for other projects but were to good to just toss. To see another 'bits and pieces' card check out yesterday's Clean and Simple Bike Ride. The Barnyard Babies stamp set was the very first one on my wish list when the new catalog came out. The sweet little animals are just so cute! For this card I had the panel with Pear Pizzazz square already stamped. It's made with a clear block inked up with an ink pad and then stamped directly onto the cardstock. I don't know why I had this piece; it must have been an idea that didn't work out for another project. It was sitting on my desk for quite some time. I stamped some grass with Old Olive ink to give some more detail. Next, I stamped and colored the cow with alcohol markers and cut her out with my trusty paper snips (seriously, if you don't have these you really need to get them! You can order them below just by clicking on the picture of the paper snips. The same goes for the rest of the supplies to make this card). I then popped her up on dimenionals onto her pasture. A little bit of embellishment in the way of Pear Pizzazz cotton ribbon, linen thread bow and the sentiment from One Big Meaning stamped in Early Espresso. Long time no post! I spent last week at the beach enjoying the time with family, the awesome view and nice weather. But now it's back home and back to the grind! I have a card to share that was made of up random pieces that didn't make the cut on other cards and were starting to pile up on the edge of my desk. You know how that goes right? Try something out and it doesn't look quite right but it's not messed up so you can't just recycle it and so it gets set aside. Well I had about 5 or 6 of these card elements sitting there so I decided it was high time to turn them into actual cards! This is one of the results of that stamping session....or maybe it was more of an assembly session. The card front was embossed with the Elegant Dots embossing folder. This was one of my "reject" card elements. The other one was the panel with the bike on it. I think I had stamped it to practice lining up the 2 parts of the bike on top of the Work of Art swoosh and it actually came out well but was on a piece of cardstock that wasn't the right size for the project I was then working on. All I did was add a slightly large Night of Navy panel behind it and added the ribbon, flags and faux button. Done! The faux button was made using 3 cardstock circles adhered together and then punched with a small hole punch for the baker's twine to go through. A button without the bulk of a real one. The bike theme is kind of appropriate as Richmond is hosting the UCI Road World Championships in a few weeks and all over town we're starting to see signs of the fun that is coming. We're planning to find a great place to cheer some of the races from. If you're coming to town for the races and need some ideas of other things to do or places to visit just let me know....we love showing off Richmond! I bet you have card pieces laying around your stamping area that just need a little accessorizing to bring out a full fledged card. Give those pieces some love and get them off your stamp table! Digging through my dusty files I came across this card that I made for last Christmas and never shared. It's a fun little shaker card and I feel like it was inspired by one I saw on Pinterest so if you know of the original please let me know and I will certainly give credit. I looked through my boards and couldn't find it. And if you search Christmas Cards on Pinterest you get about a bazillion samples and so I wasn't going to find it that way! Even though I made this last year you can easily recreate it. The sequins were ones in the holiday catalog but we now have silver sequins in the Annual Catalog that would work perfectly. The "Christmas" banner was stamped with the super popular Endless Wishes which is retired but you can substitute a different Christmas stamp. The thin baker's twine can be substituted with the thick baker's twine in Calypso Coral. The tree punch, Little Letters thinlets, Decorative Dots embossing folder and rhinestones are all still available so get to making some Christmas cards now...you'll thank me later! And speaking of Christmas cards I better get my Stampin' Up! Holiday catalog preorder sent in. I think I've been procrastinating because there are so many great things in it I don't know how I'm going to narrow it down and leave some items off. Such a terrible crafting problem isn't it! Customers should be receiving their catalogs soon too. Ordering starts on September 1. If you don't have a demonstrator I'd be glad to help you get started just get in touch...email is on my sidebar or you can leave a comment here. To order supplies to help you make this card click on the picture below and it will take you to my online store. I had some fun with embossing the other night while the boys were getting ready for bed. My stamp room is upstairs so I can "supervise" the getting ready for bed process while playing with paper and ink! How convenient right? Though sometimes I lose track of time working on a card and have to tear myself away and say good night to the boys and turn off lights. This card came together pretty quickly using the CAS(e) this Sketch challenge and the closed Colour Me challenge. Using the large Blended Bloom single stamp and embossing it with white embossing powder onto Wisteria Wonder cardstock and then then I cut it out. I mounted it onto a piece of Whisper White cardstock that was partially embossed with the new Elegant Dots embossing folder. I left the lower part plain to emboss the "hello" in black. I used a row of pearls and a narrow strip of retired Smoky Slate ribbon to separate the embossing from the sentiment. One corner is rounded just because. I needed to make a few thank you cards so I combined 2 challenges that I came across. 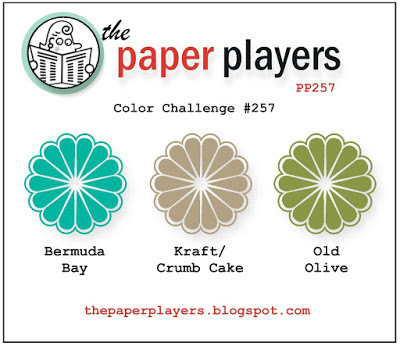 A color one from Paper Players using Crumb Cake, Bermuda Bay and Old Olive and the sketch is from Mojo Monday. I love these colors together! The Bermuda Bay and Old Olive just seem like summer colors to me so I went with Watercolor Wings to make a butterfly card. The lightest layer is Bermuda Bay stamped off once, then in full strength with the more detailed stamp and then the edges are stamped in Old Olive stamped off once. I used the coordinating framelits, Bold Butterfly to cut it out and then added the Old Olive body also stamped off. 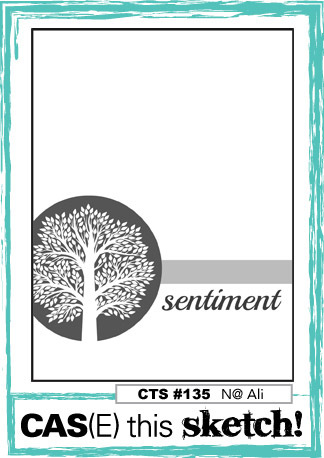 Don't forget that this stamp set and framelit set are bundled together to save 15%! Great deal! The card base is Crumb Cake and then I made a flag with the new Corrugated Paper which I hadn't cut into yet but is nice weight and texture for accent pieces. I stamped the little dotted border stamp in white craft ink across the card. The sentiment from One Big Meaning is stamped underneath in Crumb Cake ink. Using my circles framelits I created a thin circle and accented it with pearls and a few strands pulled from a piece of thick baker's twine. I popped the butterfly up on dimensionals. We have a fun day at the pool planned so I better go get all my chores taken care of so I can relax and enjoy the day! Today's card is the third project we made at my stamp club at the end of July. I wanted to make a nice summery card and tried a lot of different ideas but finally ended up with these sweet punch art popsicles. It's always good to have a variety of punches on hand; you never know when you need to make a paper popsicle! The card base is Crumb Cake and then a layer of Whisper White which is stamped with the great new Writing Notes background stamped. We used Marina Mist ink. The sentiment is from Six Sided Sampler. Now for the punches. 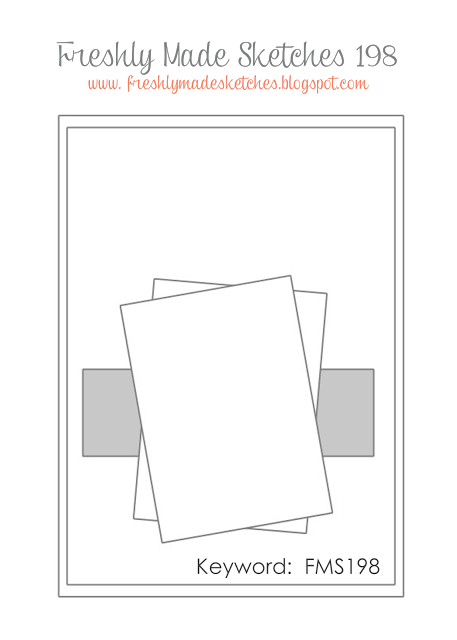 Rectangles in So Saffron and Calypso Coral have their corners rounded with the Corner Rounder punch. Then using the Word Window punch with the same colors of cardstock punch 2 for each popsicle and then one in Crumb Cake for the stick. All of the parts of the popsicles have the edges sponged for extra depth and detail. Using the smaller scallop circle punch just nip off the corner of one popsicle for a little bite mark. A baker's twine bow decorates one popsicle and the other one is popped up on dimensionals. If you would like to buy any of the supplies used to make this card you can scroll through the list and click on the item you would like and it will take you directly to my online store. Happy Monday stampers! I hope you all had a fantastic weekend! We were busy in short spurts as we had 2 unplanned out of town visitors pop in and hang out for a while. It's always nice to see old friends and favorite family members even if it's just for a few hours. The boys enjoyed some kayaking and rock hopping on the Mighty James River on Saturday while I went thrifting/junking/antiquing. I didn't find the main thing that I was searching for but came across a few nice finds so it was a very pleasant afternoon. I even stamped as I had to make a card for Sunday morning. One of our pastors and his wife welcomed a baby boy this week and I wanted to make sure to bring a little gift and card on Sunday morning to leave for them at the church office. If I didn't do it this weekend it was probably going to be forgotten about so I jumped right too it. I used the Freshly Made Sketches challenge for my layout this time. Not a whole lot of stamping on this one but a whole lot of cute if I do say so myself! The background DSP is from the recently retired Adventure Bounds DSP stack. That weathered barn wood is such a neat look on paper. Next I added a strip of Pool Party and anchored it with 2 Vintage Trinket brads---again another retired item but I can't be the only one that has some of these left? I thought the button brads were perfect for a baby card. Next up is a layer of Schoolhouse DSP. Does this large polka dot pattern look familiar? Well it was still on my desk from my Lucky Stars card from last week and I thought it was a nice contrast to the weathered wood paper. I punched the tag with the retired (boo hoo) angled tag topper punch. You can still make this look with your paper snips and a small circle/hole punch if you missed out on this punch before it retired. I tried the scalloped tag topper punch at first and it was just a little to frilly for the look I was going for this time but I do love that one too! I added some Pool Party thick baker's twine, a linen thread bow and a Vintage Trinket safety pin. A Pool Party candy dot finishes off the lower corner to help balance the layers. The adorable little lamb is stamped with Memento ink onto Whisper White cardstock and colored in with gray shades of alcohol markers. I fussy cut the lamb and then popped him up on dimensionals on the tag. The sentiment was also stamped in Memento ink. This was a fun card to put together and for such a joyful occasion! I hope you had some equally fun reasons to be stamping over the weekend! It's Fab Friday time again! It's a nice sketch right? I think it is too but it was giving me fits. Everything that I tried looked OK until I put that middle ribbon/strip on my card. It just chopped it up too much. This card took a long time and many, many ideas to get to this point! I used stamping with balloons, flowers, splotches, different colors, different techniques and none of those things was getting me a card that I liked for this round of Fab Friday! Yikes! What's a stamper to do? I cleaned up my whole stamping desk and put everything away and started fresh (it was piled about a foot high!). I pulled different colors and put aside the stamps all together! I narrowed my focus to the theme I wanted to make, Good Luck. I needed a card to go with a gift to our neighbor/petsitter/babysitter who is leaving for her freshman year of college soon. I didn't have an appropriate sentiment so I used the Little Letters thinlets and Pacific Point cardstock and built my card up from there. The DSP is the new Schoolhouse DSP and it was the first time I cut into any of it! I liked the blues with the silver. The university colors are blue and silver so I thought if worked. I punched some stars from the retired style of Silver Glimmer paper as well as a larger framelit star in Pacific point. I added a bit of ribbon to jazz up the center. I'm still not completely sold on this card but my deadline was fast approaching so I needed to get it done. As soon as I see the rest of the Design Team samples I'm sure I'll come up with 18 different ways to do this sketch! I hope you have better luck with this one than me! 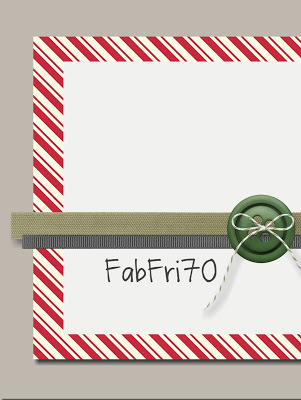 Head over to Fab Friday to see more ideas and play along! With what our weather looks like for this afternoon a water themed card seems appropriate for today's share! We made this card last week at my stamp club. It's always fun to do a new technique. At least it was new to me! I like techniques that you don't need a lot of extra supplies that you might not have on hand. This is ink and water! So easy! Step 1: sponge Soft Sky over the whole piece. Don't worry about it being completely even, splotchy is a good thing in this case! Step 2: Using a sponge dauber swirl Pool Party ink onto the cardstock making several circles. I would say probably the size of a half dollar. If you are using a larger piece of cardstock then make them larger. Step 4: Using an Aquapainter squeeze out some water to the brush tip and then "draw" a circle around the outside of the Pool Party circle, the outside of the Mint Macaron circle and a dab in the center of the Mint Macaron. Then blot up the water with a paper towel. Repeat on each circle. You can go over the circles more with the water for a more pronounced look. As the paper dries the ink will lighten up. There you go! Tie Dye! Next, we used Tip Top Taupe ink and sponged it across the bottom of our panel for some sand. Then using just the tentacles of the jellyfish in Mint Macaron ink we stamped "seaweed" on the bottom. The jellyfish seems like a strange stamp as I don't know many jellyfish fans...usually everyone want to avoid them so I'm not sure how often I'll use that stamp other than for seaweed! Then the turtles were stamped with Tip Top Taupe right over the the Tie Dye circles. White Perfect Accents are used to make bubbles and the new Very Vanilla thick baker's twine is tied around the panel. A narrow strip of Mint Macaron cardstock is torn for some extra texture. All of this is popped up on dimensionals on a Tip Top Taupe card base. Whew! I've finally had a few moments to catch my breath after taking the boys to Pennsylvania to visit my in laws for a few days. We stopped at Hershey on the way home to take in some of the chocolate fun too. We had 4 FULL days of activities between the 2 stops and then the day after we arrived back home my cousin and her family stopped to visit overnight on their way down to Myrtle Beach. It's been non-stop at the Mertz house for sure. While we didn't buy these giant chocolate bars the boys did get their fill of chocolate at Hershey! They were quiet the whole car ride home eating through their souvenirs! To add to it all, the night before we left for Pennsylvania I had my monthly stamp club. It was fun getting together with my stampers to use some more new products from the Stampin' Up! 2015-2016 Annual catalog but it made for a busy week! We made this card using the new Watercolor Wings stamp set and coordinating Bold Butterfly framelits. I sometimes don't take the time to design fun fold cards but the gatefold style is so easy I really should use it more often! All you need to do is score your card base at 2 1/8" and 6 3/8" and there you have a gatefold! I stamped the butterfly using Watermelon Wonder and Lost Lagoon. The first layer of Watermelon Wonder is stamped off once for a lighter look, then the next more detailed layer is full strength Watermelon Wonder. The final detail is stamped using Lost Lagoon. The thing that I discovered when using the stamp set and framelits together is to stamp the wing layers first, then cut it out with the framelit and then add the stamped butterfly body. My first few attempts to cut it out with the body already stamped I kept cutting off either the top or bottom. No one needs to see a mangled insect body! It's much easier to stamp the body once you have the butterfly outline to guide you. The two folds have strips of Whisper White cardstock embossed with the new Fluttering embossing folder. The final details for the card are the silver accents. Using the Tombow Multi glue I glued some silver sequins to each flap. If that small tip still isn't fine enough for you'll have to check out the extra fine tip glue that is coming out in the Holiday catalog soon...it should be perfect for these sequins an other intricate pieces! Also, using a few dimensionals I looped a bit of new silver Metallic Thread behind where the butterfly goes across the card front. It's hard to see in the photo but it adds a nice subtle detail. I used the same dimensionals to adhere the butterfly. Remember, to be able to have the flaps open you only need to attach the butterfly to one side! It's a lazy day here at home today checking things off the to do lists! I hope to get some stamping and photographing in later as well so at least I'll have stuff ready to share if I get a few moments to blog!